MacBook A1181 13″ 2.2 GHZ | The Mac Genius - Your One Stop For Premium Mac Repair & Support! Stylishly and intelligently designed for your on-the-go digital lifestyle, Apple’s MacBook is the perfect confluence of affordability, innovation, and powerful computing. Measuring a mere 1.08 inches thin and weighing in at only 5.0 pounds, the MacBook cuts a slim profile on any desk (or in any backpack or briefcase). A durable polycarbonate shell in white keeps it ready for the rough and tumble of everyday life, and a magnetic latch keeps the screen closed without a catch–that means no moving parts to snag, jam, or break. Boosted in speed with Intel’s chipset (dubbed “Santa Rosa”), you’ll enjoy quick and nimble multitasking thanks to the Core 2 Duo T7300 processor. The 13.3-inch glossy widescreen display provides the perfect combination of pixels and portability, and the integrated 802.11n Wi-Fi LAN enables computing freedom from wires and compatibility with older 802.11b/g routers as well as the faster throughput of Apple’s Airport Extreme. Other hardware features include a 120 GB hard drive, 1 GB of RAM (4 GB maximum), 8x combo Superdrive (for burning dual-layer DVDs as well as CDs), built-in 10/100/1000 BASE-T Gigabit Ethernet for high-speed networking, Bluetooth 2.0 EDR (Enhanced Data Rate), a FireWire 400 port, DVI video output, and Intel GMA X3100 graphics processor with 144 MB of shared memory. The Intel Core 2 Duo’s 128-bit SSE3 vector engine handles 128-bit computations in a single clock cycle, accelerating data manipulation by simultaneously applying a single instruction to multiple data. And its two execution cores are designed to share resources and conserve power, helping it to achieve higher levels of performance since it uses fewer watts. And with 4MB of shared L2 cache, the MacBook is a multi-tasking monster. With such substantial L2 cache, data and instructions can be kept close to the two processor cores, greatly increasing performance and allowing the entire system to work more efficiently. And, because the processor cores share the L2 cache, either can use the entire amount if the other happens to be idle. The built-in 802.11n wireless networking provides up to five times the performance and twice the range of 802.11g, but it’s also backward-compatible with 802.11a/b/g routers, enabling you to communicate with the a wide variety of Wi-Fi resources. It works seamlessly with the new AirPort Extreme with 802.11n. Use the built-in Bluetooth wireless technology to connect to your PDA or cell phone, synchronize addresses, or download pictures from your cell phone. You can also use a wireless headset for iChat audio chats and VoIP calls as well as quickly share files with a colleague. Whether you’re working on a Keynote presentation or watching a movie before you catch a flight, every document, video, and photo on your MacBook will look sharp on the glossy 13.3-inch widescreen display. With pixel-perfect 1280-by-800 resolution, it’s great for viewing and working with media. Video is powered by the Intel Graphics Media Accelerator X3100, which provides 144 MB of DDR2 SDRAM shared with main memory. It features Intel Clear Video Technology, which delivers outstanding video playback with sharper image quality, increased clarity, and enhanced visual quality of interlaced content on progressive displays. One of Apple’s most celebrated innovations is the MagSafe power adapter connector with offers a magnetic connection instead of a physical one. So, if you happen to trip over a power cord, you won’t send MacBook flying off a table or desk–the cord simply disconnects, without damage to either the cord or the system. As an added nicety, this means less wear on the connectors. The trackpad can tell if you’ve got one finger on the pedal, or two. With two, you can easily scroll around your documents or open contextual menus. When you need right-click functionality, simply open Keyboard and Mouse in System Preferences and enable the secondary click preference. And with the included Apple Remote and Front Row software, you can show off your latest photos and access your iTunes music and playlists from across the room. 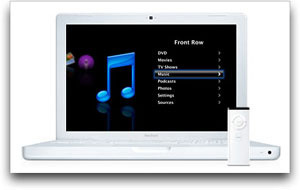 You can also use it to watch downloaded movies and TV episodes as well as control playback of DVD movies. The Apple Remote features a minimalist six buttons–just press the Menu button to activate Front Row and begin to navigate through your media. You can even use the remote to control Keynote presentations in iWork ’06.